Overlays and Reading Guides are great for reading printed text – but what about reading on a computer screen? ReadEZ Clip-Ons and spectacles can be used but why not just tint your screen! Our unique Virtual Overlay software allows you to change the colours on your PC at the click of a button. If you are using Word or Excel or other software which uses the Windows colours, you can set both the text and background colour to any colour you like. Or you can put a Virtual Overlay on the screen so that everything “behind” the overlay is tinted – just like a real overlay! 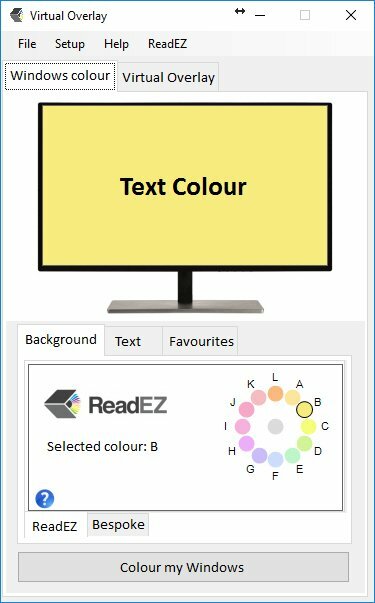 This allows you to view pdfs, web pages and other windows (which may not use Windows colours) in your preferred colour. You can either have the overlay cover the entire screen or you can size and move the overlay to cover just part of the screen. Turn the virtual overaly on and off with the click of a button. The ReadEZ Virtual Overlay works on most PCs running Windows 7 or later. Simply download the software, install it on your PC and you will be able to tint your screen to your preferred colour.